Imagine that you are an electronics retailer and on Cyber Monday every year and around Christmas your website needs to handle 15M+ transactions in a day. You would need to make sure that your environment can scale to handle the load while minimizing your CAPEX and OPEX. Microsoft’s Windows Azure is a Platform as a Service solution that provides businesses the flexibility to scale their platforms up/down based on demand. We recently delivered a webinar on the benefits of Windows Azure and how it could fit with your long term application development strategy. Every enterprise trying to develop a mobile standardization strategy runs into one major stumbling block “End User Preference”. End users don’t care if the smartphone that they like/use is enterprise ready. They prefer to use a single device that provides features that are suitable for personal and business use. They would like to bring their devices to work and be as efficient and productive as possible on a platform that they are familiar with. This phenomenon where end users buy devices for personal use and leverage it within the workplace is called the “Consumerization of IT” and it has significantly impacted the mobile device landscape in most enterprises. Here is a whitepaper that explores the consumerization of IT and dives into the strengths and weaknesses of the WP7 platform. Bing has been consistently delivering innovations over the past year like Social Media search, songs and video previews from the Zune Marketplace etc. Today they have released a great feature that integrates the FareCast airfare price predictions directly into the Search box. 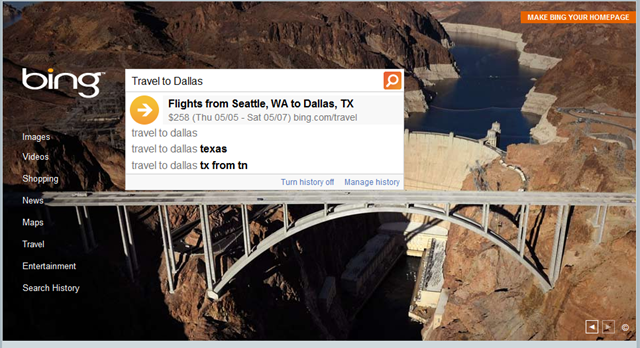 Kudos to the Bing team and hope they continue to deliver these innovations to capture Google’s marketshare! Edit: Download Links arent live yet. When you are working with a pre-built VPC, there are some things that you just dont end up noticing. I kept seeing a HTTP 404 error when configuring SQL Reporting Services in Integrated Mode. It turns out that the pre-built image had ASP.NET v1.1 installed and the default ASP.NET version was set to 1.1 when creating the Report Server directory. Once I changed this to ASP.NET 2.0 , the SSRS integration started working! I need to get my 4 hours back! !